Here’s the stuff that Jerry W. sent from Sarawak, Malaysia! Thanks again! Ahhh curry – there are very few things I’ve found to be absolutely perfect and one of them is the flavor of curry. Curry’s up there with bacon, hot sauce and garlic! 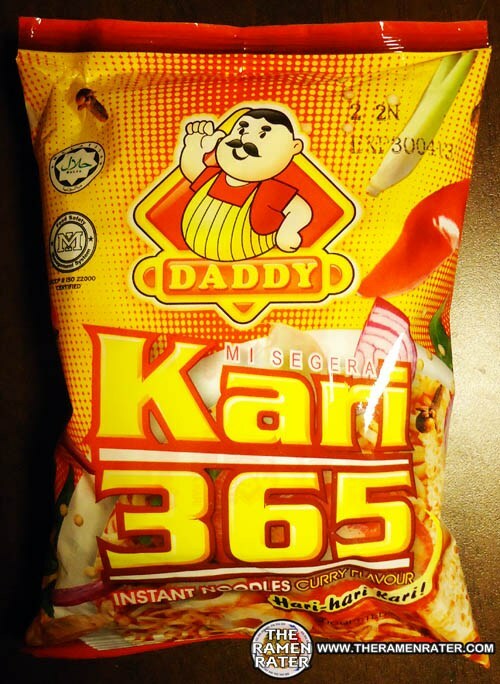 Let’s check out this unique curry noodle variety from Malaysia! Here’s the back of the package (click to enlarge). 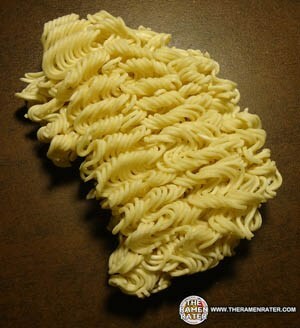 Big chunk of noodle block. The noodles are very thin. 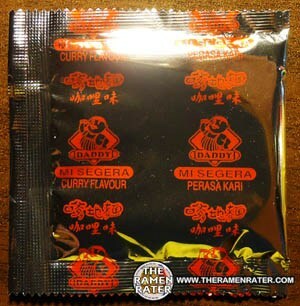 Upon opening the packet, I was greeted with that wonderful smell – curry. It was really nice! I tasted the powder – oh man! Good stuff! Finished (click to enlarge). Added sweet onions, stir-fry veggies, a fried egg with Dua Belibis, some baked chicken with Lindberg-Snider Red Baron BBQ Spice, and a little Urashima Sesame & Salt furikake. The noodles are thin and very plentiful – really excellent and very enjoyable to eat. The broth is absolutely perfect – hands-down! 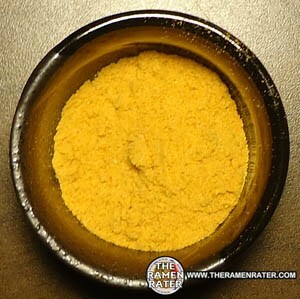 A nice color, very strong curry flavor with a little curry spicy heat to it. If you like curry, this is wonderful and you’ll love it! 5.0 out of 5.0 stars! Wow! UPC bar code 9556158184600 . 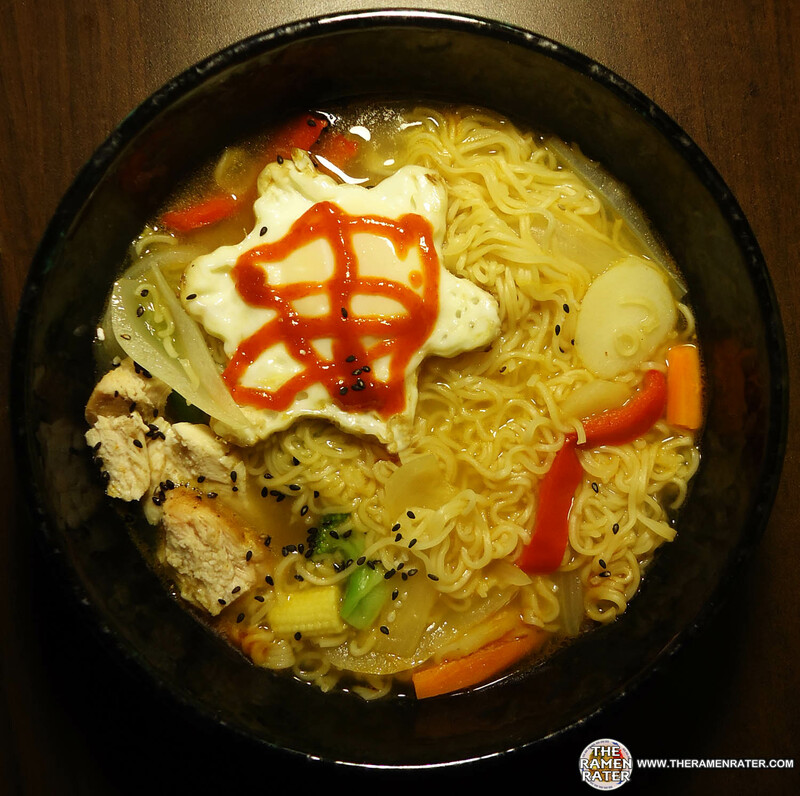 The World Instant Noodle Summit! This entry was posted in * Stars 4.1 - 5.0, Daddy, Malaysia, Other and tagged 184600, 365, 556158, 9, 9 556158 184600, 906, 9556158184600, asian instant noodle soup, bowl noodle, buckwheat, chow mein, curry, curry flavor, curry flavour, daddy, fried noodle, hans lienesch, hari-hari, hari-hari kari!, instant noodles, instant ramen noodles, kari, kari 365, korean noodles, lienesch, malay, malaysia, malaysian, mi goreng, mi segera, my, noodle, Ramen, ramen blog, ramen blogger, ramen rater, ramen recipe, ramen review, ramen reviewer, ramen reviewers, ramen reviews, ramen video, ramenrater, ramenrater.com, ramyeon, ramyun, rater, rating, ratings, review, reviews, saifun, saimin, sarawak, sbfm industries, seattle, shin ramen.black, shin ramyun, sibu, soba, spicy, the ramen rater, the ramenrater, theramenrater, theramenrater.com, top ramen, udon, washing, wheat, yakisoba on October 21, 2012 by Hans "The Ramen Rater" Lienesch. Thanks for the review. I’m an ardent lover of curry and noodles from Australia, and can’t seem to locate any information on this brand – needless to say, I’m champing at the bit to give these a try! 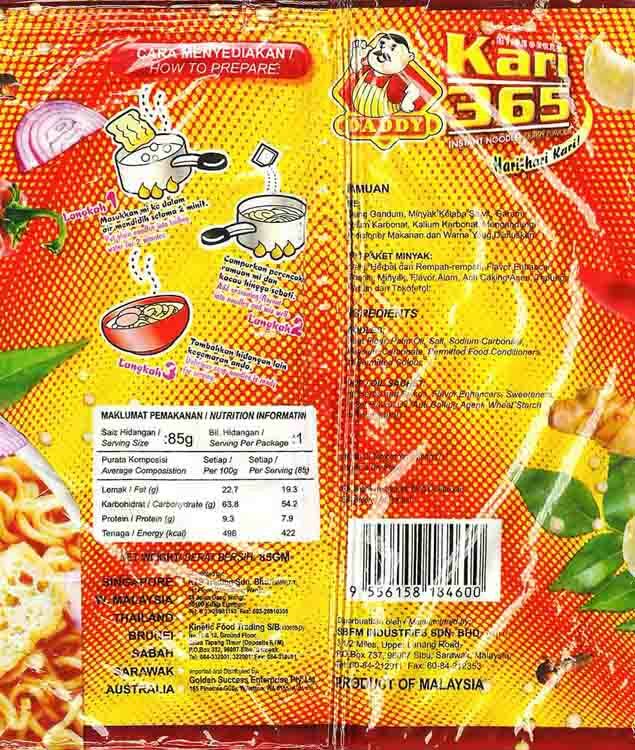 Or would any of your Malaysian fans have any more info on this magnum opus of the noddle-maker’s craft? Or am I going to have to take a trip to Malaysia just to get my hands on these beauties?